Welcome to The Werewolf Cafe's September full moon phase! This month's full moon is called the "The Full Harvest Moon" (this name is due to the traditional gathering of crops at this time of year). Special note: This year's autumnal equinox is on September 22, 2006. This full moon phase marks the brand new Werewolf Cafe website! It has been long overdue and it still has a way to go, but we hope you like it anyway. In addition to the cosmetic changes, that should be easy to see, we have several new features underneath the hood, so to speak, that should make it easier to grow and expand the site. The first truely new feature of the site is the calendar. We will be using the calendar to post upcoming events, movie releases, book releases, forum member birthdays, full moon phases and more. You can submit calendar entries from our new submission page. Another great new feature is the search box at the top of the left column. We always had a search box, but it didn't always quite work right...not it does. We've also been able to recover all the archives, so old posting you may not have been able to find are now back! The site is not completely done, but we were so anxious to start using it, we decided to launch it this month. We still have a lot of plans and a lot of work to do, and we'd be happy to hear what you have to say. You can use our new contact page to let us know what you think. We also have a ton of great newcontent for this month. As of my writing this, a lot has been posted, but there will be lot more over the next couple days...so keep checking back. 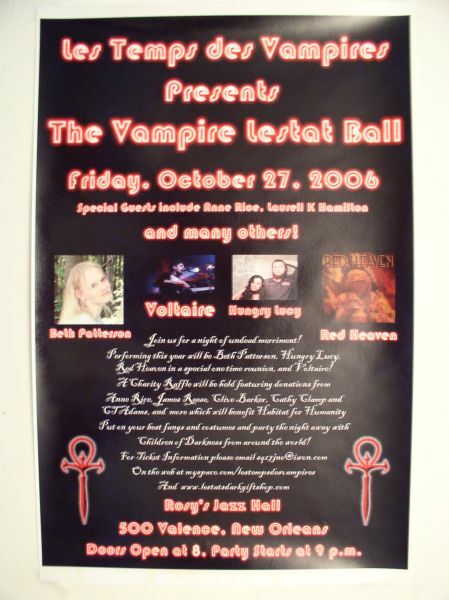 The Vampire Lestat Ball is just around the corner...on Friday, October 27, 2006....and once again The Werewolf Cafe will be sponsoring and promoting this wonderful event. It great to see so many members of The Werewolf Cafe involved in such a worthy event. You can find out more at their MySpace Page. Information about tickets, special guests, entertainment, and raffes (proceeds of which will be donated to Habitat for Humanity) can be found at Crescendo Magazine's web site. 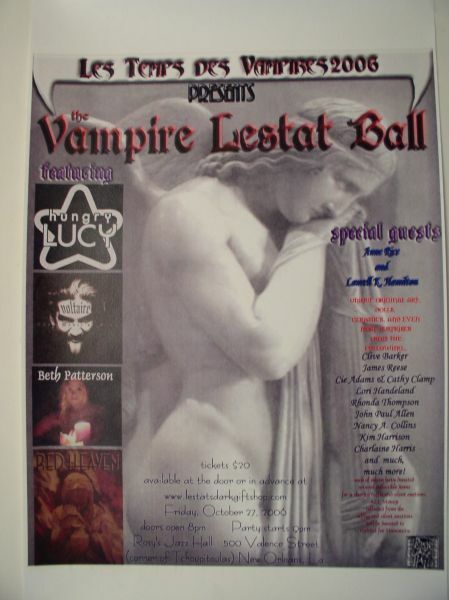 Below you can see copies of the posters promoting the ball. Special note: Because of past tradition around here, The Werewolf Cafe will open again around the time of the October full moon phase and then it will remain open through Halloween (October 31).